FlexSecure FS 35 1/8" x 12" Cable Seals - In-Stock (Please order in multiples of 10 or 200). Stock Imprint: "Sealed" w/Consecutive Numbering from Stock. 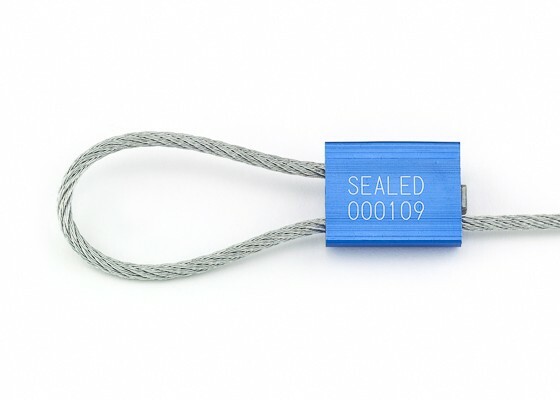 The FS 35 is an ISO 17712 rated 1/8" high security cable seal for many applications and is popular for sealing bulk railcars and intermodal containers and trailers. The non-preform cable frays wildly when cut and is galvanized for corrosion protection. The patent pending locking mechanism inside the anodized aluminum housing makes sure your goods are safe in transit. C-TPAT & PIP COMPLIANT.